Assembling your own dog first aid kit means you'll be prepared when trouble strikes. Get a list of supplies to include plus tips on basic first aid, toxic plants, vital statistics and more. Please make and have your own first aid kit ready at all times! You never know when disaster will strike. 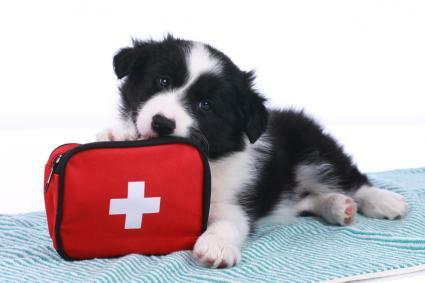 You have the option to make a small inexpensive first aid kit to one that might rival a home vet office, your choice! Write on the container in indelible ink, the phone numbers for your vet, the closest emergency animal hospital, and poison control hotlines. Also list your own name, address and phone numbers. If you prefer to purchase a ready-made kit, Medi+ Pet Deluxe First Aid Kit is a good choice. Mix Epsom salt at 1 teaspoon per 2 cups of warm water for drawing out infection and bathing itchy paws or skin. Use baking soda for soothing skin conditions. Styptic powder is used to stop bleeding of torn or over clipped toenails. Milk of magnesia or kaopectate is good for dog stomach upset. Pepto Bismol is okay for dogs, but not cats. Bendadryl can be used for allergic reactions in dogs, including bug bites or stings. A gentle pet sedative can be bought at some pet health supply stores - a good brand is Rescue Remedy. Aspirin is safe for a dog's pain - but not cats. Never use acetaminophen or ibuprofen. Always use small doses or call your vet before administering aspirin to get the correct dose. Mild grease-cutting dishwashing liquid is good for cleaning dog skin or removing sticky substances. Keep an appropriately sized dog carrier or crate at home for emergencies. If someone is taking care of your pet while you're away: show them where you keep the first aid kit and vet records, your vet and emergency animal hospital info, how to contact you, and the name and phone number of a friend or relative in case you are unavailable. In addition, let your vet know in advance who you have authorized to take your pet to the vet in your absence, and that you will pay for any emergency visit. Temperature: Normal rate for dogs is 98 to 102.5 degrees. Thermometer should be almost clean when removed. Abnormalities are indicated by blood, diarrhea, or black, tarry stool. Those who have faced emergencies can tell you it is essential to get your first aid kit together and get familiar with first aid measures before you are confronted with an accident, emergency, or sudden illness. Many situations require fast and correct action to prevent further injury, infection, or even death. So, assemble a first aid kit now, and then you'll be ready when your pet (or a human) needs immediate help.